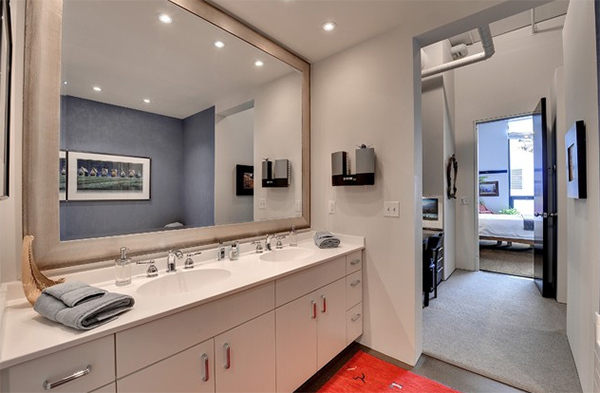 A bathroom will not be complete without a vanity. 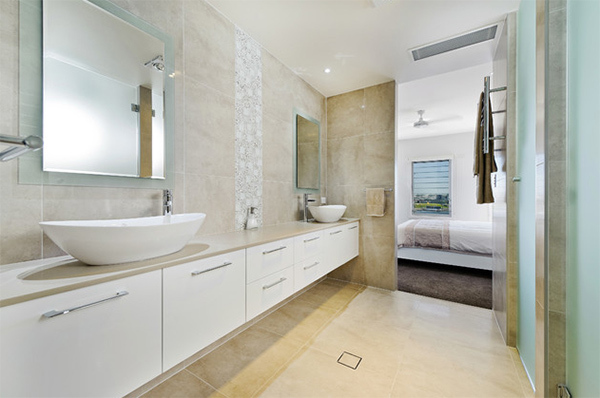 A vanity is where you can find the sink and storage spaces for items that you need in the bathroom. 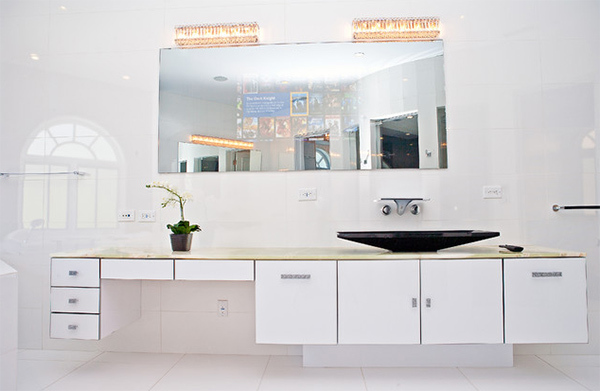 But aside from that function, a vanity can also add beauty to your bathroom. That is why you can see different designs, colors and materials for a bathroom vanity. 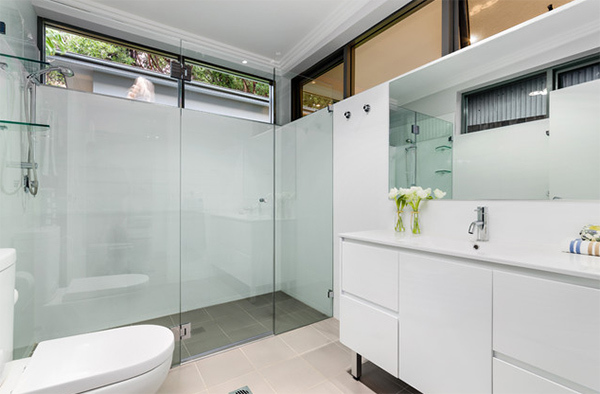 We have gathered some photos of bathrooms with white vanity. The ones we have today are in contemporary bathrooms. 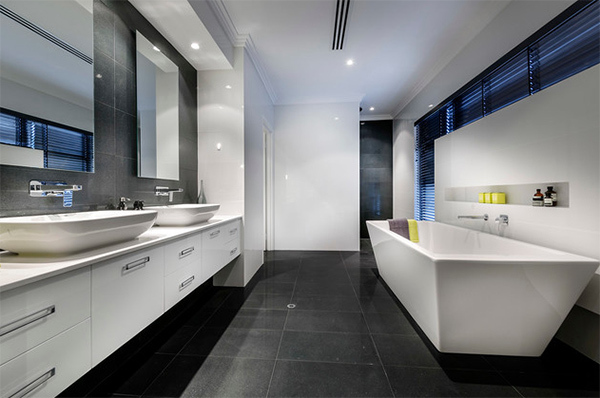 Most of the vanity has sleek designs and beautiful. 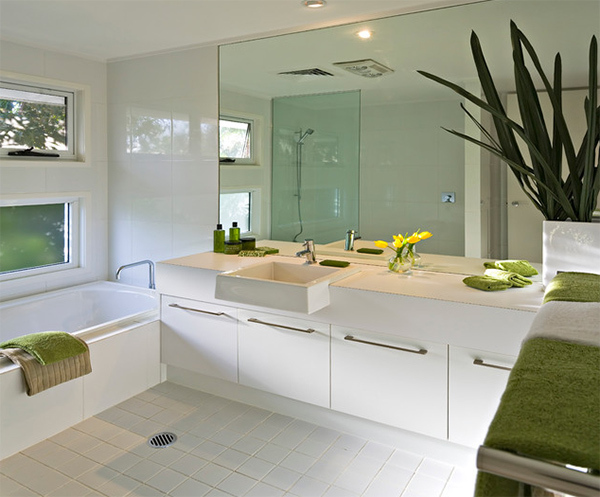 Some would even have a countertop with a different color which can be a good contrast for the white bathroom vanity. Let us take a look at them below. 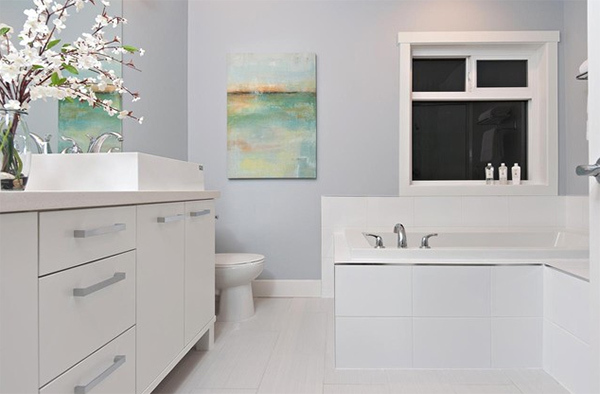 A floating white bathroom vanity with cabinets and drawers. I like how the handles were positioned. Look at this one! Green backsplash for the walls and green hardware too. Lovely! 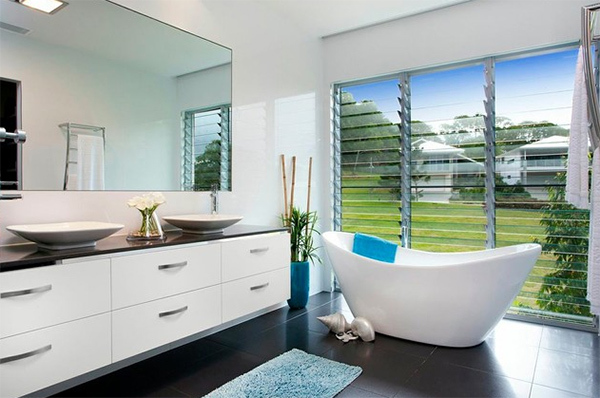 Aside from the lovely view outside, this bathroom has a vanity with neat design. 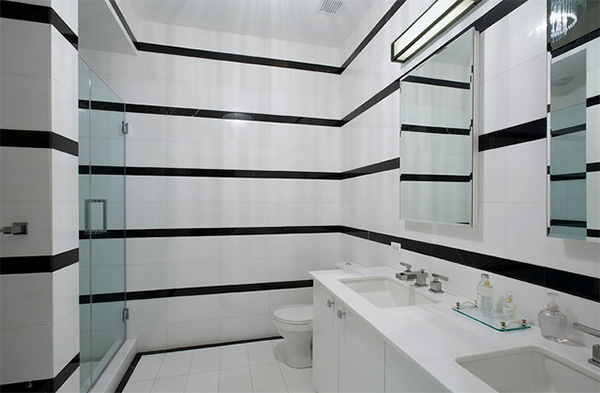 A bathroom with black stripes on a white wall- and the rest of it is white too. Adding silver handles to the vanity would be a lovely idea as it bring sophistication into it. Don’t you just love the texture on the wall? 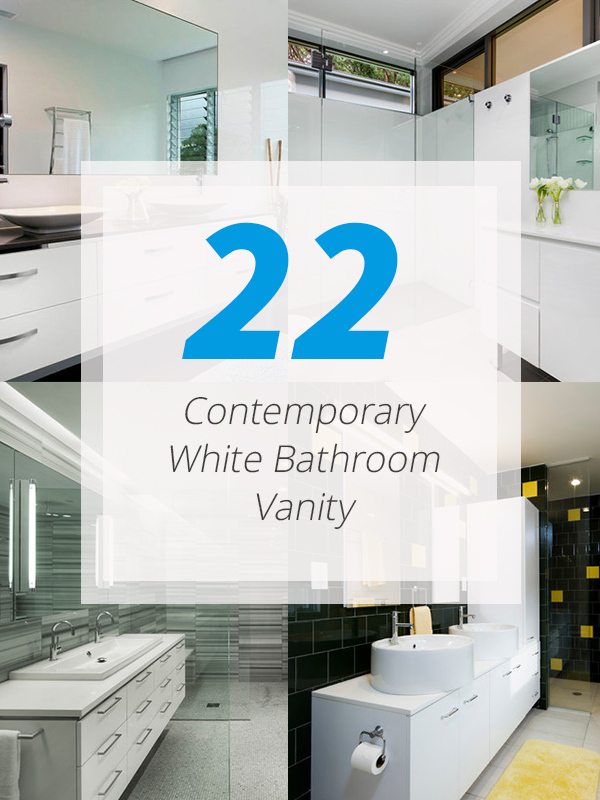 The white vanity could be highlighted because of its walling and flooring finishes. When a vanity has legs, it looks like a furniture. 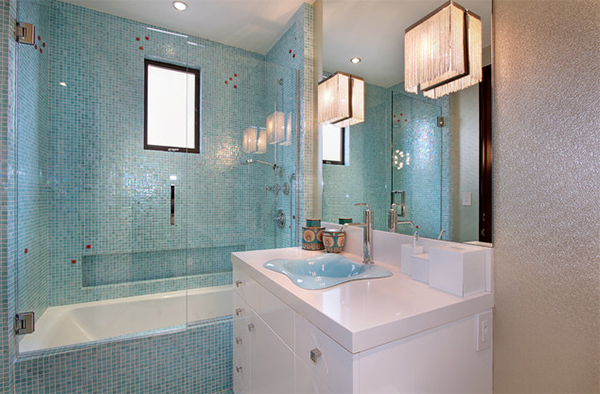 A striking small bathroom with an exciting color palette and white vanity. Beautiful. 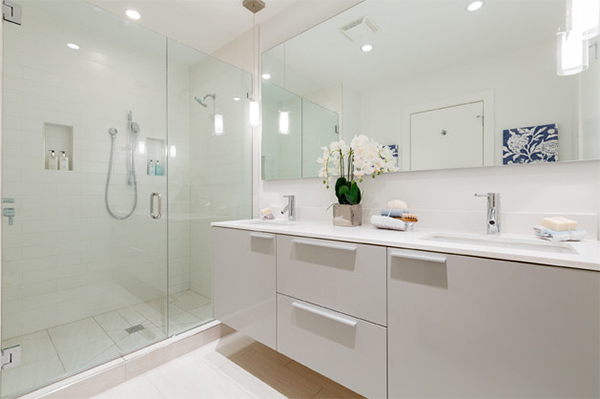 I like the neatness of this bathroom and the all white colors against a light gray wall. 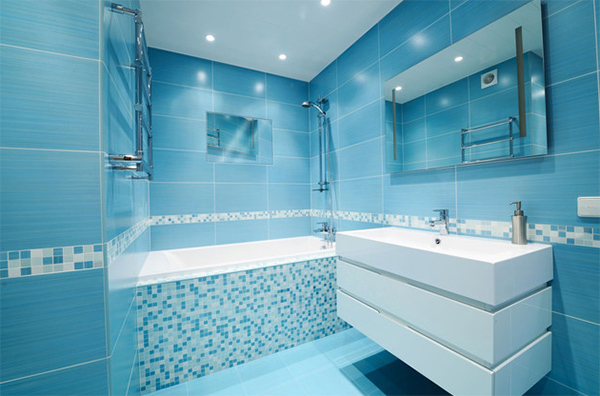 For sure, you will say that this is one cool bathroom because of its combination of colors. Using white for the vanity balanced the look of this bathroom with a busy pattern for the wall. 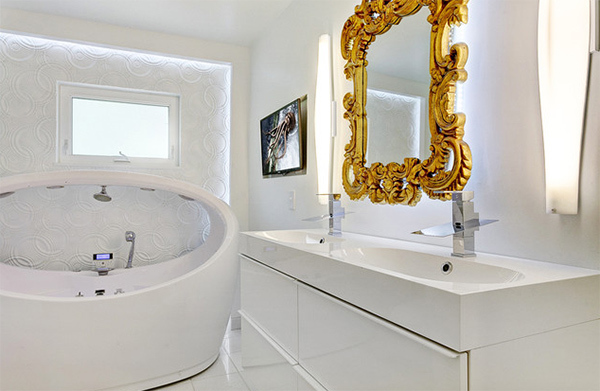 Gorgeous wall on that part near the bath tub and a floating vanity in white color too. 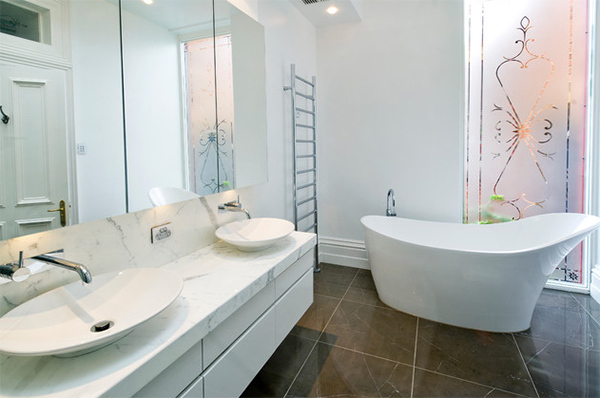 A luxurious-looking yes simple bathroom in white with a wooden bath tub. Take a look at this one. The vanity is lighted under it! Black as countertop for a white vanity is a great idea to bring in contrast. 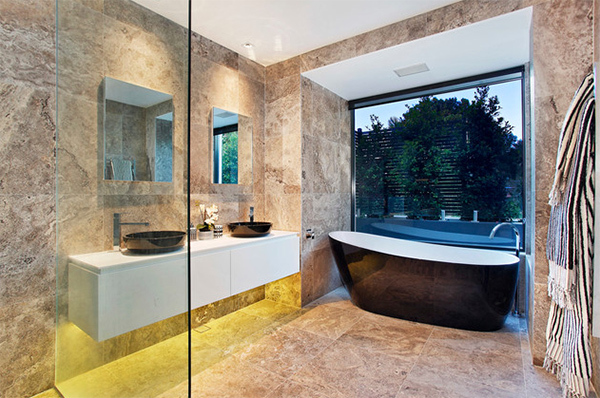 An en-suite with a floating vanity and a combination of beige and various textures for the tiles. 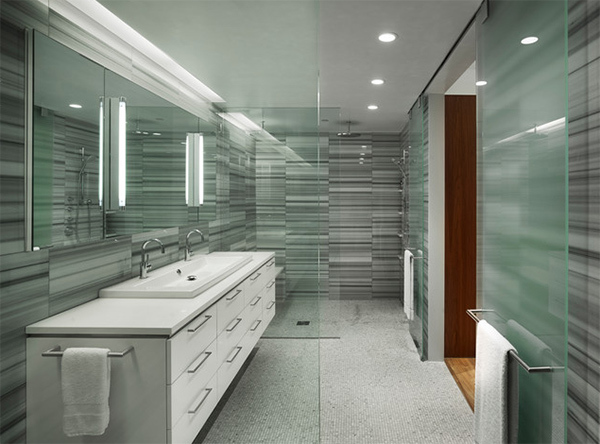 We would all agree that the frosted glass is amazing and yes, the vanity is simple yet very functional. With black flooring, everything that is white would really be on the limelight! 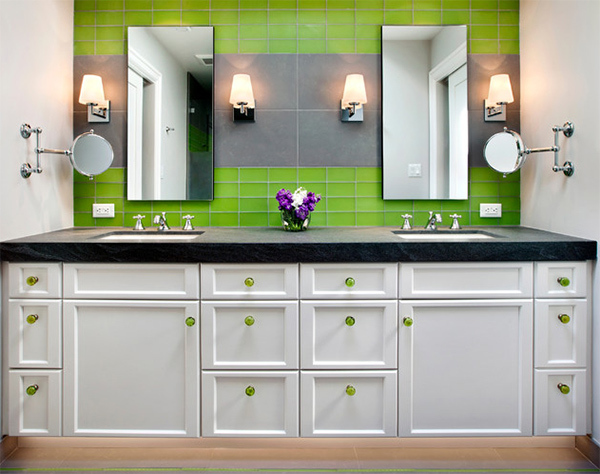 Pops of green can be seen in this contemporary white bathroom. Love the colors here! 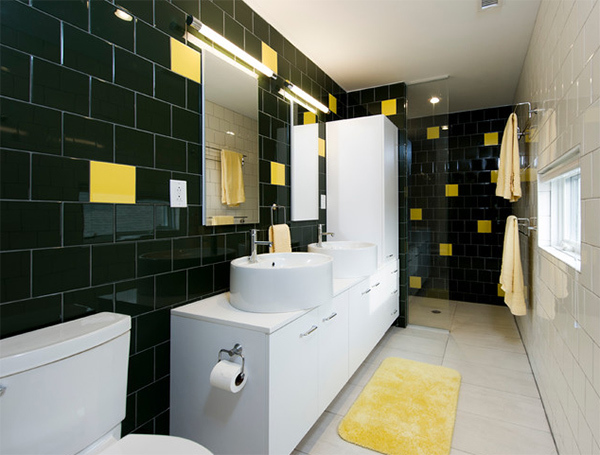 Using white for the vanity is indeed a perfect idea as this one has black and yellow wall colors. An ensuite bathroom for the bedroom featuring a twist on classic style with crocodile wallpaper. This one has a unique design for the vanity and a black sink! 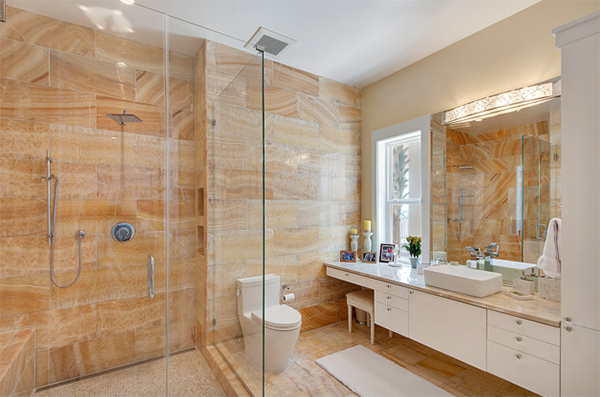 What can say about these bathrooms? They sure are lovely! And I am pretty sure you were able to notice the white bathroom vanity inside it because they are all very attractive. 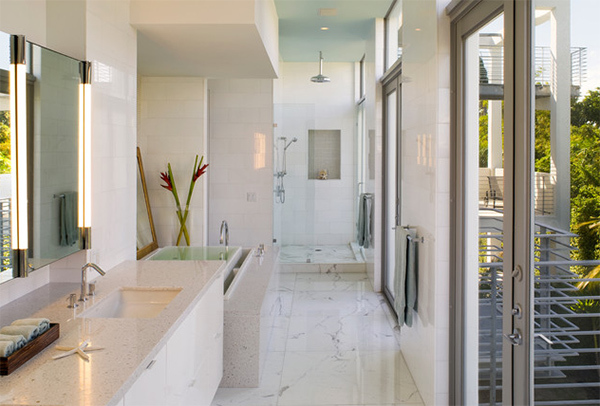 I have observed that most of them are floating to give the bathroom a more spacious look while others have legs for a furniture-like appeal. Don’t you love this list?